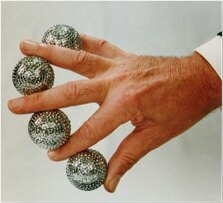 The effect of multiplying four balls from the air it’s a classic in Magic but it’s also a classic of Vernet Magic. His manufacture makes them very easy to see from the stage and assure a confident hold. This is the traditional silver model made in chromium plated ABS plastic. The set consist of three textured balls and a shell surfaced with reflective material so they’ll pick up and reflect the light in the room where they are being used.he textured surface makes the balls easy the handle without slipping. Don’t be afraid of dropping them.